As the first full-scale study of Benjamin's practice of autobiography in any language, Gerhard Richter's admirable work performs a major scholarly service. 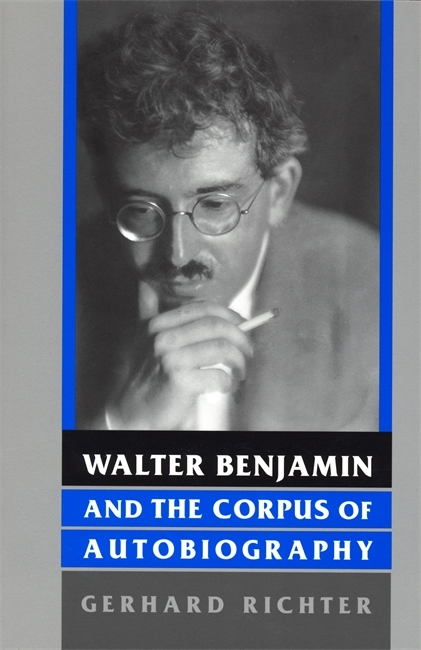 Although Walter Benjamin (1892-1940) is considered one of the most significant writers and theorists in twentieth-century Western culture, his enigmatic sense of the political has eluded definition. His later work in particular stages a perpetual but little understood confrontation with German fascism. Gerhard Richter shows that Benjamin's engagement with the political cannot be understood in terms of unified concepts and fully deducible theses that can be easily verified or refuted. Rather than explaining his sense of the political, Benjamin enacts it in the movement of his language. Richter traces Benjamin's radical notions of the political through a series of corporeal figures in his often neglected autobiographical writings—the Moscow Diary, the Berlin Chronicle, and the Berlin Childhood around 1900. Each text subtly mobilizes a different trope of anatomy: the body, the ear, and the eye. Richter places these figures into a wide network of references from Benjamin's corpus demonstrating that Benjamin's innovative acts of self-portraiture are inseparable from his analyses of the physiognomy of Weimar culture and German fascism. Benjamin's preoccupation with the body becomes visible as a political struggle that illuminates the relations among the self, history, reading, and language. Benjamin's autobiographies, as Richter shows, negate fascism and its ideology of stable meaning with each turn away from an essential corporeal self. Readers interested in modem German literature and culture, literary and cultural theory, comparative literature, Weimar culture, and fascism will welcome this book. Gerhard Richter is associate professor of German and affiliate professor in comparative literature at the University of Wisconsin, Madison. Gerhard Richter's Walter Benjamin and the Corpus of Autobiography breaks new ground in the burgeoning field of Benjamin studies. Through meticulous, theoretically informed analyses of Benjamin's autobiographical texts, Richter uncovers the corporeal dynamic of Benjamin's writing. The book is a stimulating exploration of the perceptual foundations of literary production. Normal 0 0 1 97 558 4 1 685 11.1280 0 0 0 Gerhard Richter's Walter Benjamin and the Corpus of Autobiography is not merely the most extensive and insightful treatment of Benjamin's autobiographical writings. It also offers a challenging reading of Benjamin's writings as a whole, a reading that serves as an important corrective to any facile appropriation of portions of Benjamin's corpus. Drawing on a deep knowledge of the breadth of Benjamin's production as well as on a critical mastery of contemporary cultural theory, Richter presents a resistant and refractory Benjaminian text. He has a remarkable ear for the instabilities, fissures, and cruxes of Benjamin's language. This is a remarkable achievement. The context of Gerhard Richter's absorbing study, which concentrates on the autobiographical materials, makes a definite point of justifying this book amid so many other critical texts preceding it by pointing out that his volume is the first to birng all the autobiographical texts preceding it by pointing out that his volume is the first to bring all the autobiographical texts under scrutiny together for consideration as a distinct corpus, he is not tempted to recreate the personal subject from whose endeavors at life these times and evens had been retold. Gerhard Richter's study is so effective that it exceeds its own intentions and opens up an illumination of language in our times as well as in Benjamin's. This text is magisterial . . . [It] renews one's amazement at the power and beauty of Benjamin's thinking. I rate this work very highly. Gerhard Richter's study is so effective that it exceeds its own intentions and opens up an illumination of language in our times as well as in Benjamin's.